. : My Early Anniversary Surprise! Let me just start off by saying that Trevor is THE best husband in the world and spoils me way too much! So here is how the story goes... I have been wanting a new puppy for about a year now and we weren't finding any great deals on any Yorkie puppies. 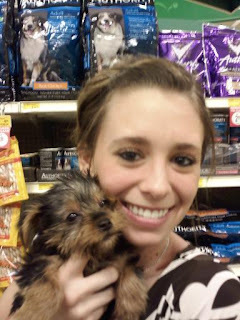 Yorkie puppies are my FAVORITE and i didn't want to settle for any other puppy. So i wasn't really thinking about getting a puppy anytime soon. 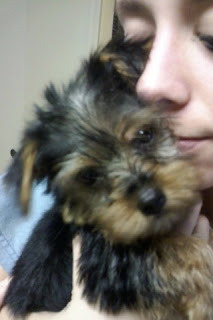 One day this week i decided that i needed to look on craigslist to see if there were any postings on a new Yorkie puppy. 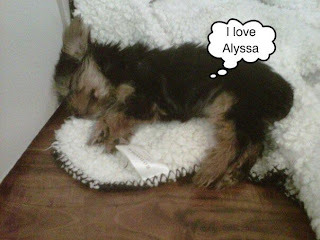 the first posting i saw was for a 10 week old Yorkie puppy! Exactly what i wanted!! So i immediately emailed the lady with the puppy and never got a response.... I then later looked the next day on craigslist to see if the posting was still there but it had been taken off.. i was devastated but just put it behind me. A lady at Trevor's work told us that she would be selling Yorkie puppies in the next 7 weeks so i got excited for that a nd just thought we would go look at puppies then. Little did i know, Trevor was planning something behind my back! So we are driving the next morning on the way there, with me in anticipation on where the heck we were going. We arrive at a Starbucks in Chandler and i was a little confused. Trevor told me we were meeting someone there and that we had to wait for her. the lady finally pulled up in her car and when she started to walk towards us, she was holding the 10 week old baby Yorkie! I seriously was ecstatic and couldn't believe Trevor had really got her for me!